(CNN) -- Briton Mark Cavendish claimed his third sprint victory of the race when powering away from his rivals to win the 175km 13th stage of the Giro d'Italia. 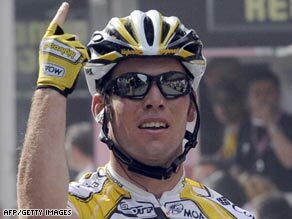 Cavendish again proves he is the number one sprinter with victory in the 13th stage of the Giro d'Italia. The Team Columbia rider recovered from coming off his bike after just 20km to once again prove he is the fastest rider in the peloton, out-sprinting veteran Italian Alessandro Petacchi with Australian Allan Davis back in third. Cavendish's victory also provided Columbia with a remarkable sixth stage win of the race. However, Cavendish will not be adding to his roll of honor after it was confirmed on Friday that he is pulling out of the race to concentrate on preparing for the Tour de France. Team Colombia manager Rolf Aldag told Press Association Sport: "He has had a very successful couple of weeks at the Giro but he is still young and he has a long career ahead of him. "He has already raced 55 days this year and it is our view that the best thing for Mark is to take some recovery now before the Tour de France." There was no change in the overall classification with all the leaders finishing the flat stage to Firenze in the peloton. It means Russian Denis Menchov retains the leader's pink jersey that he claimed after winning Thursday's 12th stage time-trial. The Rababobank rider remains 34 seconds ahead of 2007 winner Danilo Di Luca with American Levi Leipheimer a further six seconds behind in third place overall. The race turns north on Saturday and back into the mountains with a tough 174km stage from Campi Bisenzio to Bologna through the Appenines.